During last three years, the National Research Nuclear University MEPhI has been delivering lectures by leading experts of the International Atomic Energy Agency (IAEA) for students of the nuclear engineering specialties within the framework of the course “International nuclear cooperation. Technical aspects” developed by the Department of Theoretical and Experimental Physics of Nuclear Reactors. The aim of the course is to study the main approaches, mechanisms and means of international nuclear cooperation as the key resource in the peaceful use of nuclear energy. 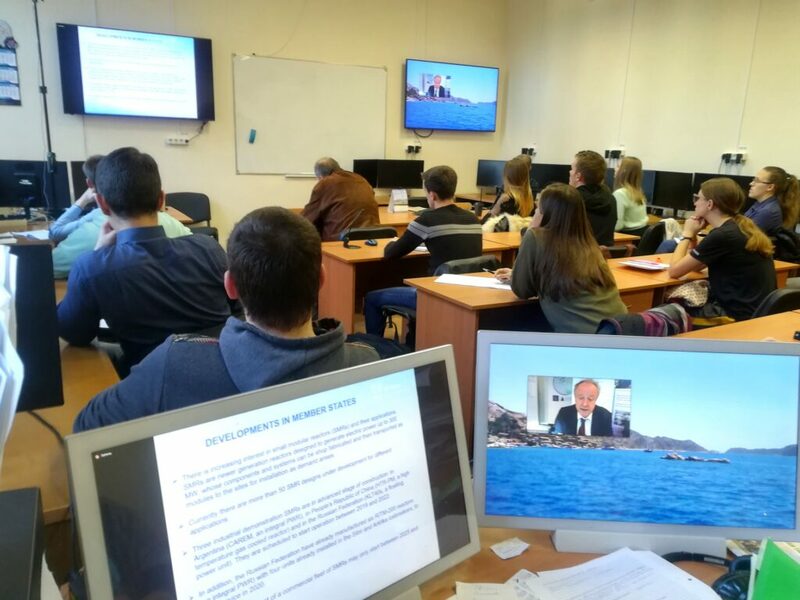 Taking into account the great interest in the course from the partner universities of the “Regional Network for Education and Training in Nuclear Technology” (STAR-NET), it was decided to expand the course audience in 2018/2019 academic year by using the specialized webinars for interested universities-members of the STAR-NET. •	International cooperation in the field of the research reactors. Applications of research reactors. The first webinars in September 2018 were attended by students from universities of Minsk (BSUIR, BSU, BNTU), Moscow (NRNU MEPhI) and Odessa (ONPU). The first lecture was devoted to the IAEA, its goals, objectives and programmes, the second — to status, prospects and issues for small modular reactors. In total, each lecture was attended by more than 60 students of various specialities related to the design and operation of nuclear facilities. The webinars are open for all STAR-NET partner-universities and will be held regularly. As a result of the course, students will receive understanding of the international nuclear cooperation system and activities of the IAEA – the international organization serving as the world’s leading forum for scientific and technical cooperation in the field of peaceful uses of nuclear technology. Examples of cooperation in different areas will show how the results of international cooperation can be used in practical activities of young professionals and how they can use the resources of knowledge obtained from international programmes in their work.